The energy to do more of what you love. 45g OR 4 tbsp. 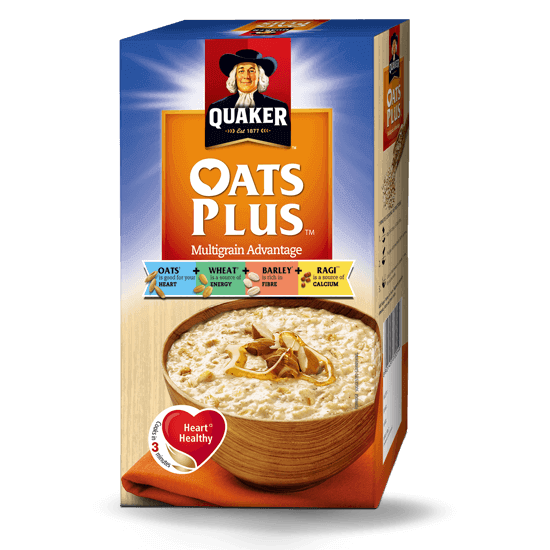 of Oats Plus. 1 ¼glass skimmed milk (260ml approx.). Cook or Microwave for approx. 3 mins. ¤ Diets rich in whole grains(Oats) & low in total fat, saturated fat & cholesterol may help reduce the risk of heart diseases. As part of a balanced diet and accompanied by a healthy & active lifestyle; USDA Dietary Guidelines 2010. * National Barley Foods Council. ** Whole Grains and Health : Perspective for Asian Indians. ǂ Based on 1 Serve (45g) of dry product. 1 Nutritionists recommend 48g daily intake of wholegrain, USDA Dietary Guidelines, 2010. 2,4 Nutrient Requirements & RDA for Indians 2010 (NIN).